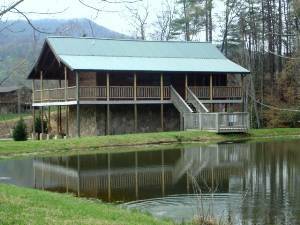 "The Fishing Hole" is located 10 miles from Pigeon Forge, 5 miles from Townsend and 15 miles from Gatlinburg. Is has its own private pond that is stocked with fish, but is catch-n-release. Swimming Pool access with-in walking distance. Newly refinished in May of 2007 with the next update being a fountain in the pond. 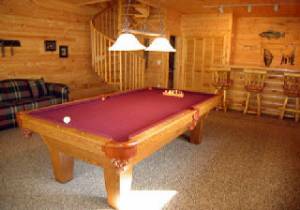 The Fishing Hole has a King Log Bed and then has a Queen Sofa Sleeper in the Game Room wich also features a Bar, Pool Table and a Slot Machine. 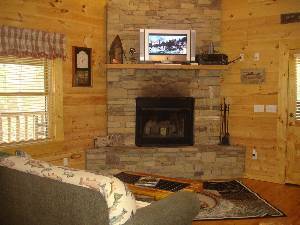 Cabin is fully equiped with central heating and air, woodburning fireplace, 1.5 baths, washer and dryer, dishwasher, rocking chairs, porch swing and hot tub, gas grill, outdoor fire-pit, cable with premium package, HDTV Plasma TV and High Speed Wireless Internet. Complete kitchen and all linens are provided. Come enjoy Ripley Aquairum in the Smokies or Dollywood or Dollys Splash Country. 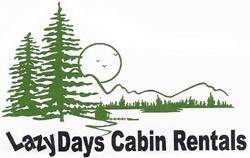 Call now to reserve, this cabin books very quickly. Thanks so much for making our 20th Anniversary a great one. You have a wonderful place here. The location and the decorations are wonderful. Loved the pond, but didn't get a chance to fish. 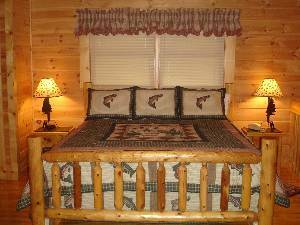 This is a great cabin and we enjoyed spending time in it. I got out of the car and caught 6 fish! It is great, I will keep you posted throughout the weekend. It has rained all day but, it's still a great cabin and we're having a great time. Sunday, and it's still raining, but we had fun. We had a wonderful time. The cabin is awsome. Thank you so much it, you though of everything. Came to celebrate 40th birthday and had a great time. Great cabin, location and wonderful scenery. Our dog (Chole) had a great time and loved the pond, sticks and snow. We will be back with our family from England this year. We loved the cabin! We had a great time fishing, even though we only caught one brim. We had a blast in the hot tub and really enjoyed the outdoor tv. The first day the pond was partially frozen so we experinced some ice fishing. We were able to visit Ripley's Aquarium, so we also seen plenty of fish there. We hope to come back and give fishing another shot. Thanks for the great trip. We absolutely LOVED the cabin! Very relaxing, the attention to detail and the fishing decor was amazing. 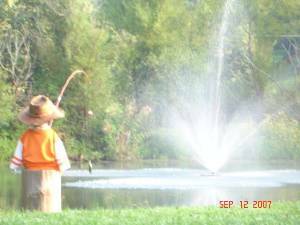 My husband loved fishing, although it was slow because part of the pond was frozen. We loved the hot tub and the fireplace. Our doggies were in heaven. We'd love to come back many more times. This is our favorite place. Yeah! We got to use the hot tub every night. Thank you so much for being so patient with us and renting us the most beautiful cabin. We loved the pool table, hot tub and log swing. The boys had a blast and we can't wait to come back. Britney and I had a wonderful time. Thank you very much. We enjoyed everything from the bed for the very much needed sleep, the convenience of the gas grill, the spa, fireplace, pool table and the big beautiful swing on the porch at 3 am when the rain was pouring down, the closeness of the pond for early morning fishing (caught 3 Bluegill). The smell of wood was entoxicating which was complimented well with a bottle of wine. We enjoyed all the thoughfulness that went into this place, it has everything. Most of all, we appreciated getting way from it all and spending time with each other again without worring about if we had the little things we use everyday. What an enchanting retreat! The cabin is wonderful and the grounds are so relaxing. What a perfect location. We hope to visit again soon. Enjoyed our 2nd stay, perfect location, nice cabin. My husband caught a nice bass. The children enjoyed the hot tub. We would like to come back for a 3rd time. PERFECT! Had a wonderful time. Vacationed here for our 33rd Anniversary. We will be back for our 34th or before. Thanks for the beautiful cabin. Everything was great. We certanly enjoyed our brief stay at The Fishing Hole. 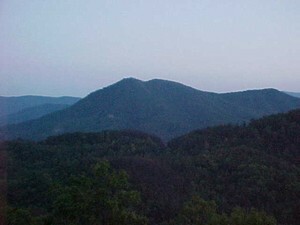 This cabin is awsome and the location is perfect for visiting to Pigeon Forge/Gatlinburg and the Smoky Mountains. When we come back to this area to vacation we will be hoping to stay here again. Thanks for allowing us to stay. Loved the cabin. Our second time here. We will be back. We absolutely loved our stay at the Fishing Hole. We had alot of fun fishing even though we didn't catch anything except the turtle that broke our line. We loved the surrounding, hope to be back someday. This is a real nice place. We had a wonderful time at The Fishing Hole. The fish decor is awsome. We enjoyed feeding the fish. The frogs are huge in the pond. We enjoyed the outdoor fire ring and Emily loved the hot tub. I loved the porch and the pond while Dave loved the plasma tv, and we all enjoyed the pool table. Thanks for the awsome vaction. We love The Fishing Hole! We caught around 120 fish. It's great and we had lots of fun. We love The Fishing Hole. This is our 2nd time here. My husband caught lots of fish and the turtle 4 times. He likes hot dogs and bread. My family and I really loved the cabin.It was everything that we hoped that it would be.The decor was wonderful and the hot tub was great.We caught a few bass in the lake and enjoyed the view from the swing ! We hope to come back again. June 24, 2007 Reviewer: fredda bonds & Jose Marin From: warner robins,ga. we spent a week of our honeymoon in skyhigh and loved every minute of it. worth every dollar the view and everything made our honeymoon more memorable than we could have ever imagined. What a great cabin. We loved it. peace and quiet. Very comfortable. roasted corn you will ever find. Beautiful little cabin. Looked untouched and extremely clean. We will visit again!! This cabin was right in the middle of all of the attractions and has a beautiful view. If you want to get away there is plenty to dot this cabn. There is a lake,swimming pool, jacuzzi, satellite tv, and much, much, more. Email me if you have any questions. We have enjoyed our stay at Sky High. Everything was beautiful. Thank you for sharing your cabin. Very, very nice. This is our first time coming to the mountains and staying in a cabin. What a beautiful cabin and a wonderful experience. We would love to come back and rent Sky High again!! This cabin is PERFECT with only one flaw - we have to leave. Thanks for letting us enjoy your beautiful cabin. F.Y.I. A swing would be a perfect addion. P.S. Porch swing has been addedd. Oh what a spectacular view. The cabin is awesome. We enjoyed every part of our vacation. 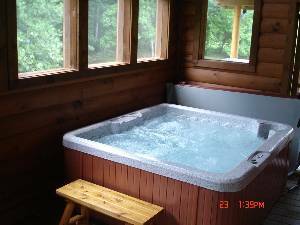 We hope to return next year, keep the water warm in the hot tub it was awesome sitting in it with a full moon above. We have all had a great time at "Sky High". We loved the zebra room bed! It is so Soft. The leopard room is equally impressive. It is decorated so well we felt like we were camping in the forest. Not to mention the wonderful view. We look forward to comming back to "Sky High" soon! What a great honeymoon1 :-) We couldn't have asked for a more beautiful place. The view, peace-&-quiet, hot tub!! We hope to come back in 1 year and do it all over again! We celebrated our honeymoon in this cabin and what a delight! The view and the hot tub was so nice overlooking the mountains. We plan to come back every year in this cabin to celebrate our love for each other. Our son and daught-in-law gave us this beautiful weekend at "Sky High". It has been a wonderful weekend. We enjoyed your beautiful cabin and as usual the Tennessee Mountains are "Beauty with out words"
Lucky and Tamera all we can say is WOW! Sky High is amazing and we truley enjoyed ourselves. We think the animal print decor is awesome! Even though it rained all weekend we didn't let that dampen our stay here at Sky High. As cloudy and foggy as it was, the full moon did come out and show his face on our last night which we felt was a perfect ending to our great weekend! We didn't get to see the amazing view of the stars at night so we will definitely be back for that. Thank you so much and God Bless. P.S. The hot tub was amazing! Thank you for a memroable experience. This is definately a week we won't forget! The view is breathtaking and the cabin is everything or more than we imagined! We're sorr to go, but not for long. We hope to see it all again in the near future! :-) Thanks again!! Thanks Lucky and Tamera for such a great week. The cabin is very nice and the view is great! We hope to stay here again in the future. We are here for our honeymoon!! Very beautiful cabin with a perfect view. This is a perfect way to start a marraige. Hope to come back for our first anniversary. We will refer family and friends. P.S. A porch swing would be a perfect addion so a couple could sit and snuggle together. Porch swing added by owner in July 2002, thanks to the Curran's. The most awesome Mother's Day ever!! Can't wait to come back again. Greatly enjoyed your cabin and our visit. ( Also appreciate your offer to get for us the "Indy 500"-Thank you) We certainly plan to make a return visit, perhaps at the Christmas season. May God Bless! "JUST MARRIED" We enjoyed out stay, great view. The hot tub was very enjoyable along with the pool table. Sky High had No Limits. We have enjoyed our stay at Sky High. The view is great and the leopard and zebra decorations were great as well. We were here on our honeymoon and it brought out the animal in us. We plan to come back. Your cabin is beautiful and we have enjoyed our stay. We enjoyed the hospitality, privacy and majesty of the mountains. "Sky High" was the "perfect" place for our honeymoon. We will be back. Thank you again and God Bless. We had a wonderful stay in you charming cabin-love the aninmal print theme! Thank-you for sharing you "other" home with us! We enjoyed a wonderful family vacation. The cabin is adorable, the view is spectacular and we don't want to leave. We will definitley be back!! Thank You!! great cabin, much too short visit. Merry Christmas. We really enjoyed our stay on our honeymoon, the cabin was wonderful! We had a great time at Sky High. The view is wonderful especially from the hot tub. The cabin is beautiful and we will remember this trip for a long time. Thank you so much! We enjoyed our stay and the view of the stars from the hot tub. May offer other specials or free nights in the slow season. Will also consider all 1 night rentals but may be at a higher rate.